This morning, while fighting off a grumbling stomach, it was decided that a trip to 44 Stanley was in order. Well i must say that we were not let down! Perched under the trees, while the sun shone through, Shell and I so enjoyed our breakfast at the Salvation Cafe! What a treat for a saturday morning. The atmosphere is riddled with the hum of happy conversations while the fountain in the square splashes about. Tea served in old iron pots and perfectly prepared food makes this cafe one of my BEST! A must do on your JHB list of adventures. The friendly staff also makes this place an absolute delight. Perfect if you want to take a book and sip on a cup of coffee, you can enjoy the breeze outside or sit up on the balcony inside. 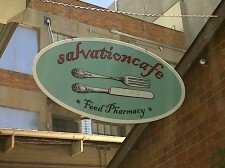 The Salvation Cafe is described as a Food Pharmacy and this I can completely agree with. What ever craving you are having will most certainly be satisfied here. Recommended dish of the day… The savoury french toast!!! Scrumptious 🙂 and of course a good cuppa coffee!